When we started designing dinosaur exhibitions in 2008, we said, “woah, these creatures are big!” Imagine our surprise seven years later when we started designing exhibitions for something even larger … sea creatures! “Creatures of the Deep: Past, Present & Myth” made a splash when it opened this May. SeaWorld Gold Coast is the temporary home of two dozen animatronic sea creatures, including some that exist only in the depths of our imagination. And since everything is full size, including a Blue Whale, the scale of the exhibit is truly legendary. Initially, Double Dare worked with the team at Dinosaurs Unearthed to craft the exhibition concept. During the development of the project, we continued to direct the overall creative effort. But the most fun we had? Creating a rough scale model of the huge, angry Kraken guarding the exhibition entrance. 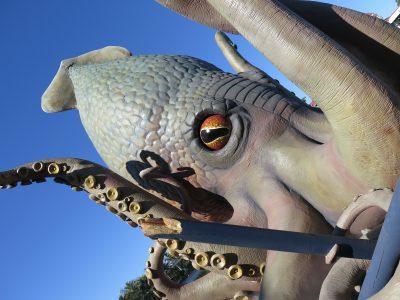 Word to the wise: it turns out that it is no laughing matter to create an 8m tall cephalopod. (Particularly if it is smashing a ship’s prow to bits!) The factory making the creatures had to adapt many of their manufacturing techniques. Despite the challenges, they managed to pull off the massive undertaking. As fishing stories go, we’re not sure that we’ll ever be able to top this one for scale.